In honor of Father’s Day 2014 on June 15th we’re giving away a $50 gift card! Memorable Gifts wants to make your Dad’s Day shopping a little bit easier. Don’t miss your chance to win a $50 gift card to our online store. Memorable Gifts wishes you a very memorable Father’s Day! 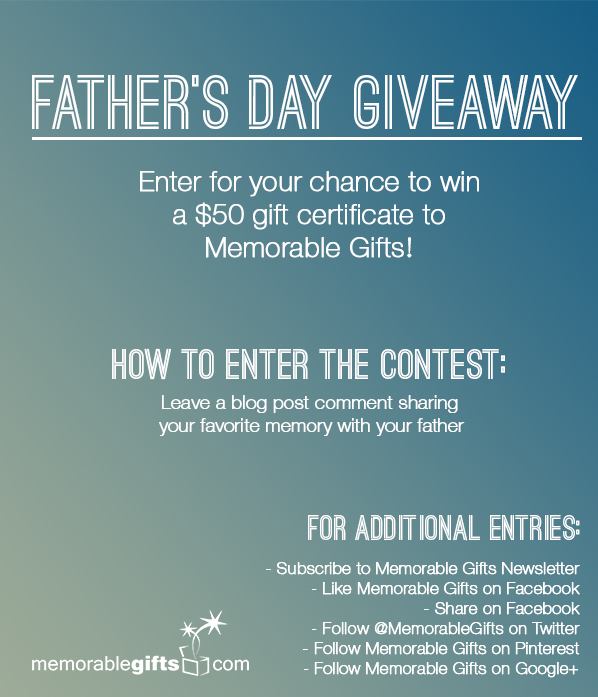 To enter the Father’s Day giveaway leave a blog post comment sharing your favorite memory with your father and simply fill out the Rafflecopter form below. Please only one entry per person/email/IP. All entries will be verified and the winner will be selected at random on June 15th. The winner will be contacted on June 16th via email and has 48 hours to respond or another winner will be drawn. Contest ends on June 15, 2014 at 11:59 PM. Good luck! My favourite memory is my dad pushing me around in the wheel barrel. My favorite memory of my father is him teaching me how to cook and how to fish! My greatest memory with my father is when we took a fishing trip to the White River in Arkansas and fished together for the first time in many, many years! My favorite memories with my Dad were when he showed me all the stars through his telescope. He could find and explain any thing in our galaxy to me. I really miss those nights, but I know when I look up at the Milky Way or The Big Dipper at night, my Dad is up there somewhere among the stars now.